This looked like a fun anthology, out for Valentine’s Day. Eight stories, all new except one. I gave it a try. The New Gods in “An Apokolips Love Story” by writer James Tynion IV and artist Jesus Merino. Too grim for my taste, but I suppose true to the spirit of Apokolips, Darkseid’s home world. Granny Goodness tortures a captured rebel. Kilowog in “Old Scars, Fresh Wounds” by writer Kyle Higgins and artist Cian Tormey is much more fun, and reminiscent of the Green Lantern Corps of Steve Englehart’s day. Kilowog is set up on a date by Guy Gardner, but things don’t go well. Bizarro in “Backward Heart” by writer Saladin Ahmed and artist Max Dunbar is reasonably fun, as Bizarro meets an appealing super-heroine and agrees to help her save a world. Bizarro dialogue is kind of annoying to read, though. Hawkgirl in “Galentine’s Day” by writher Cecil Castellucci and artist Elena Casagrande has Hawkgirl moping about her breakup with Hawkman (news to me) and getting support from Starfire and Green Lantern Jessica Cruz. Predictable but not bad. Space Cabbie in “GPS I Love You” by writer Aaron Gillespie and artist Max Raynor. Cabbie’s cab has been upgraded with an alluring female GPS (Galactic Positioning Service?) who he hates at first but then loves. Amusing idea, well told. Crush in “Crushed,” written by Andrea Shea, art by Amacay Mahuelpan. If there must be a female Lobo, in this case probably his daughter, I suppose this is not a bad story for her, having a crush on a female cage fighter with a whole other agenda. Lois Lane and Superman in “Glasses” by writer Jeff Loveness and artist Tom Grummett is charming and fun, my favorite story in the book. Lois ponders what she sees in Clark/Superman and finds good reasons. Adam Strange in “The Planet Pendulum” by writer Gardner Fox and artists Mike Sekowski and Bernard Sachs is a reprint from the 1960s. I would have liked it more if they chose a Carmine Infantino art one, but okay for nostalgia. Not a bad read, recommended. 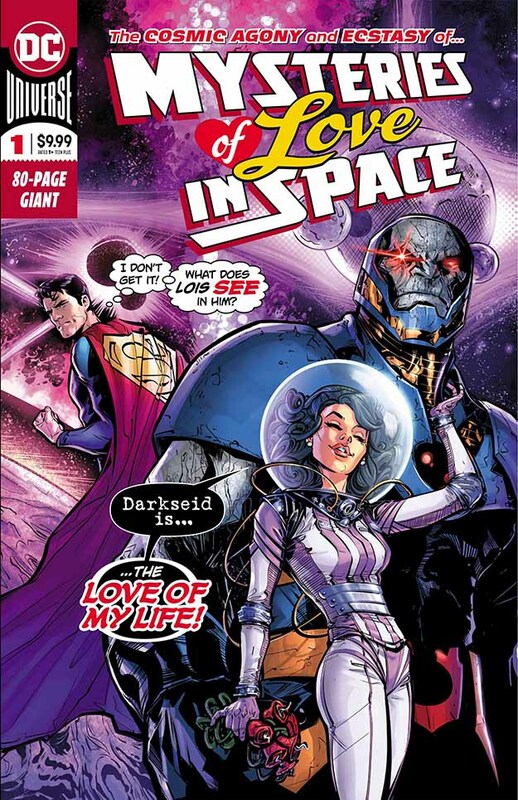 This entry was posted in Comics, Reviews on March 20, 2019 by Todd.